I have spent the past month reading Good News About Injustice: A Witness of Courage in a Hurting World by Gary Haugen, founder of International Justice Mission (IJM). Haugen started IJM after investigating the Rwandan genocide in 1994 among the nearly one million bodies, mostly of women and children, that were brutally hacked to death. Good News About Injustice takes a hard look at the injustice that exists in our world, examines the biblical call to justice, explains how a Christian can prepare for the work of justice, explains how injustice works and how IJM works against it. One of the main things Haugen deals with in his book that I greatly appreciated is the topic of hope. When we look at the atrocities that happen around the globe, it looks hopeless from a human standpoint. But it isn't from God's. 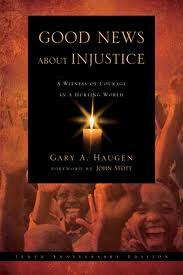 Haugen shows readers how we can put our hope in the God of justice, compassion, moral clarity and rescue. This is something we have to understand if we want to see change in our world. In the discussion guide in the back of my book, there's a quote by C.S. Lewis: "Despair is a greater sin than any of the sins that provoke it." The question was to reflect on this and determine whether or not we agreed and why. I didn't have to ponder this long before I determined it to be true. Despair indeed is a greater sin than the sins that provoke it. Why? Because despair gives power to sin. Despair says the sin is too great and too difficult to conquer. Despair gives power to sin and Satan and thus belittles the power of our great God. But the truth is Christ has power over sin, and because of that, we can have hope! Hope is important because it recognizes that God is in control and that He will one day have ultimate justice on the earth and make all things new. Hope is crucial because it recognizes that those suffering can be rescued, and by God's grace, they can experience healing and renewal in their lives. And the beautiful thing is that God raises up His children to be a part of this, to be His hands and feet, to bring love and compassion to the hurting and give them hope as well. No, injustice is not a hopeless problem. There is hope for the little boy slaving in a brick kiln, working to pay off his grandfather's debt. There is hope for the girl who was promised a good job, but rather finds herself sold into a brothel instead, raped repeatedly every day by lustful men and treated as a commodity, not a person. There is hope for the man wrongfully accused and imprisoned and the widow forced off her property, having everything taken from her simply because her husband died. There is hope! And as Christians, we are to put our hope in the God of justice, the God who desires to bring about justice on the earth, and then be His instruments to bring hope to a hurting, dying world. Are you willing to be that hope, to be a part of the good news about injustice? Then read the book and learn what you can do. Justice in this world is often incomplete or even non- existent. Because of this fact, it is easy to give in to despair and stop trying. After all, God will settle all these things in the final judgment, right? I admit that I am at times guilty of such thinking, but it is wrong indeed for us to give up when we have been called to be His presence on Earth. We are called to struggle against things like injustice. We are called to serve our generation while we are here just as Jesus served the people of his generation. May God give us the courage and strength to speak up for the weak and oppressed in our day.